Kristina Doubet is a professor in the College of Education at James Madison University in Harrisonburg, Virginia, where she has received the Distinguished Teacher Award, the Madison Scholar Award, and the Sarah Miller Luck Endowed Professorship for Excellence in Education. As an independent consultant and ASCD Faculty member, Doubet has partnered with more than 100 schools, districts, and organizations around initiatives related to differentiated instruction, the Understanding by Design® framework, classroom assessment, digital learning, and classroom management and grouping. She is the coauthor (with Jessica Hockett) of Differentiation in Middle and High School: Strategies to Engage All Learners—the companion book to this volume—and of The Differentiated Flipped Classroom: A Practical Guide to Digital Learning (with Eric Carbaugh). She is also the coauthor (with Carol Ann Tomlinson) of Smart in the Middle Grades: Classrooms That Work for Bright Middle Schoolers. Doubet taught middle and high school language arts for 10 years and has also served as an instructional coach and a curriculum developer in elementary and middle school classrooms. 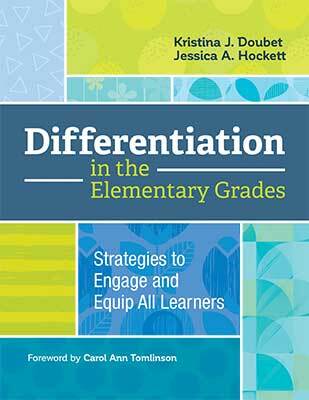 This comprehensive resource for elementary school teachers explores how to use differentiated instruction to engage students and help them be more successful learners.